In the midst of another severe wildfire season, lets take a look at some of the potential channels in which economic problems may materialize in the future. This preliminary assessment is something our office put together a year ago and was originally published in our December 2017 forecast document but never here on the blog. The summary and concerns very much apply to this year as well, although the names of the fires need to be updated. In terms of the general process of economic recovery from natural disasters, see our previous post. 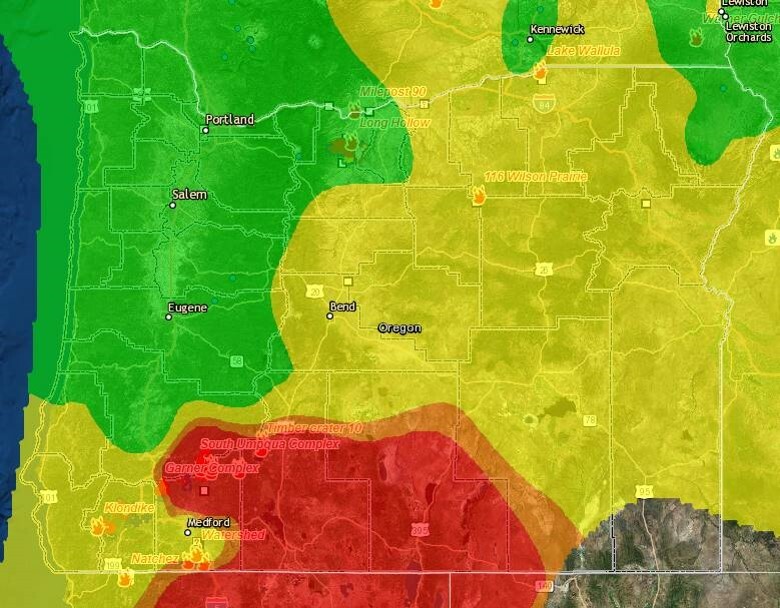 First, however, a quick look at the location of wildfires and the air quality around the state. The air quality in the Rogue Valley and Klamath Basin is unhealthy both due to local fires and smoke blowing in from the Mendocino complex fire in northern California. With local fires burning in southern Oregon, the Gorge, and in eastern Oregon, much of these areas have moderate air quality (yellow). Finally, with no local fires and favorable winds, much of the coast and the Willamette Valley still has healthy air quality. From a long-term perspective, the scariest potential impact of Oregon’s 2017 [and 2018] wildfire season is that fewer households and investments may be attracted to the region moving forward. Oregon’s primary comparative advantage remains its ability to draw skilled workers away from other states. To the extent that local quality of life has been reduced, or if Oregon is perceived as a riskier or costlier place to live and do business, this advantage will be less pronounced. Our office’s long-run economic outlook would need to be lowered, if this were true. Increased risk lowers growth prospects. If investors and households view Oregon as a riskier place, businesses, property owners, and governments will face higher costs moving forward. While it is still early given wildfire season ended not too long ago, interest rates spreads between Oregon’s municipal bonds and bonds in other states have not widened. However this may not only reflect a stable Oregon outlook, but also heightened risk in other states following a severe hurricane season. The  transportation disruptions due to the wildfires did bring significant costs, although they were temporary. Westbound lanes of I-84 were closed for 8 days in the Gorge, and eastbound lanes for 19 days. Economists at the Oregon Department of Transportation estimated the daily costs to trucking firms due to higher operating costs and payroll to be $250,000 to $290,000 per day. Passenger traffic was diverted to Washington SR14. Rail traffic disruptions were similarly modest. Union Pacific noted that tracks were shut down for four days, with customers experienced up to 48 hour delays on shipments. Assessing the net impact on Oregon businesses is difficult. While areas in the Gorge were shut down, other areas benefited from the diverted traffic. In particular, retailers on WA14, OR35 and OR216 reported increased traffic and consumer demand. However the fact that some areas temporarily benefited comes as little consolation to many businesses that may have suffered permanent damage. Small businesses that were negatively hit by closures, particularly during their peak season when winter reserves are accumulated, will bear watching and could require public help over the next couple of years. In particular, access to capital is difficult for many small businesses. Cash flow issues for some may start to show up over the winter, and for others down the road when they face a major expense. In terms of specific industries, hospitality firms and retailers are the most likely to see the impacts. Agriculture firms and manufacturers were less likely to be impacted, however they did see increased shipping costs and/or delays. Additionally, many service firms that depend upon local customers were also likely spared long-term losses, even as they experienced a quiet few weeks. As the Oregon Employment Department has been tracking, the impact of the fires on direct employment is minimal based on the initial, preliminary data available today. As more complete data becomes available, impacts are more likely to be seen in hours worked per employee, and wages, rather than whether an individual has a job or not. For Oregon overall and the impacted regional economies within the state, the concern is slower growth moving forward as tourists, investments, and new firms or residents avoid the impacted areas. As such, looking for historical precedents may help to understand what Oregon has in store moving forward. First, the Yellowstone fires of 1988 are a notorious example of a major fire event in a federally-owned tourist area. 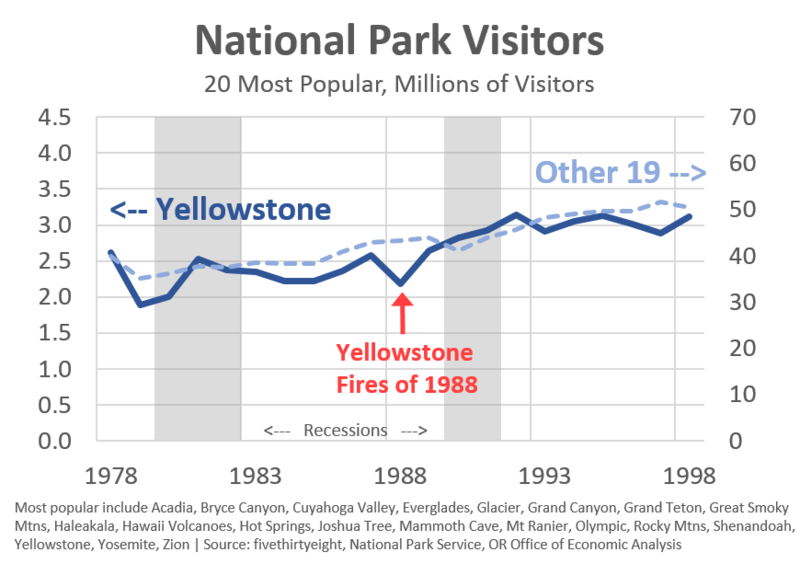 Surprisingly, looking at visitation to Yellowstone and the other major and popular national parks, there does not seem to be a noticeable impact outside of the year of the fires. Tourism and visitors returned the following year, and the year after, and the year after. Yellowstone is huge. There are lots of trees, meadows, wildlife and the like. Just like the Gorge is big. There are myriad trails, waterfalls, and outdoor opportunities for people to enjoy right now and certainly next year. Concerns in Ashland and possibly Brookings are more problematic. If cancellations of Shakespeare plays becomes a reoccurring pattern, year over year that could hurt attendance over an extended period of time. For Brookings and surrounding areas that were impacted by the Chetco Bar fire, there could be larger local impacts to the extent it represents a smaller geographic area with fewer opportunities (potentially). Second, tourism around Mt. Saint Helens exhibited a similarly quick rebound following the eruption in 1980. Hotel occupancy one month after the eruption was down 15% in Portland relative to the previous year. Declines in areas with more ash problems like Spokane (-26%) and Yakima (-64%) were even more pronounced. However much of this decline could also be traced to high gas prices and the onset of a nationwide recession. That said, the eruption soon turned into a tourism asset. By August of 1980, just months after the eruption, U.S. Forest Service observation booths were welcoming 4,000 visitors per day.